1.The Browns fell behind early thanks to two strong Texans scoring drives. They held the Texans to a field goal on the first, but with 44 seconds remaining in the first quarter, Deshaun Watson faked a handoff, rolled to his right and floated an 11-yard touchdown pass to Jordan Thomas. The Texans’ 51 first-quarter rushing yards on 12 carries contributed to the success of the play-action touchdown. 2. Baker Mayfield’s first interception since Week 9 provided one of the biggest plays of the game for Houston. With 7:36 remaining in the first half, Jadeveon Clowney pressured Mayfield into throwing toward Antonio Callaway before Mayfield wanted to, and Houston’s Zach Cunningham caught the pass instead. Mayfield tried to knock Cunningham out of bounds before Cunningham could reach the end zone on the return, but Cunningham reached the ball over the goal line before he drifted out of bounds. The Browns fell further behind, 17-0. 3. Mayfield was intercepted looking for Callaway again on the next drive. Callaway looked to have found an opening in the Texans defense, but Johnathan Joseph closed that window quickly and advanced to midfield. The Texans turned that interception into three points on the ensuing possession. This interception came on what started as a productive drive for the Browns. They were in Houston territory, only adding to the frustration of the turnover. 4. On the Browns’ most promising drive of the game, Mayfield threw his third interception with 1:52 remaining in the first half. Mayfield tried a deep pass to David Njoku in the end zone on third-and-10 at the Houston 38, but he overthrew the second-year tight end. Andre Hal made a toe-tapping interception in the back of the end zone. 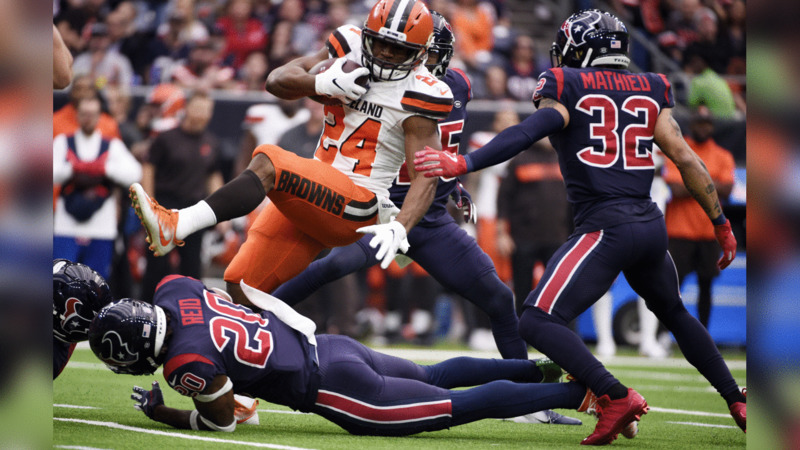 The Texans turned that turnover into a field goal, too, and the Browns trailed 23-0 at halftime. 5. The Browns finally scored with 9:42 remaining in the third quarter. Nick Chubb capped a nine-play, 75-yard drive with a two-yard touchdown run. The star of the drive, though, was Mayfield, who threw for 74 yards on the opening second-half drive after a rough first half. 6. The Browns showed life again when Mayfield found Callaway for two 70+ yard passes on the same drive. Amazingly, though, neither ended on a positive note. The first went for a touchdown, but the touchdown was called back because left tackle Greg Robinson was caught holding Whitney Mercilus. On the second, Callaway veered toward Justin Reid as he ran the last few yards toward the end zone, and Reid punched the ball out of Callaway’s hands. The Texans recovered for a touchback with 3:55 remaining in the third quarter. 7. Any chance the Browns had at a comeback dissolved when they failed to convert on fourth-and-five at the Texans’ 36 with 9:50 remaining. Mayfield threw for Njoku on a seam route, but the pass was batted to the turf by Tyrann Mathieu.